Introduction: Ours is the century of invention and innovation yet the yawning gap between rich and poor keeps on growing. The severely deprived are just not a priority. The World Bank estimates about 385 million children live in “extreme poverty” (under US$ 1.95 a day). According to UNICEF, poverty kills 22,000 children each day “in some of the poorest villages on earth”. Habitat for Humanity tells us that 1.6 billion human beings live in “inadequate shelter”. Hundreds of millions are without clean water or proper sanitation. Almost half of the world’s population lives under the poverty line (variable from country to country), including 4.5 percent of Americans, 33 percent of Britons, 20 percent of Greeks, 23 percent of Indians and 27 percent of Egyptians. It’s time to put the plight of struggling families at the top of every governments’ agenda not only because abandoning populations to extreme hardship and misery is a moral obscenity and an affront to the essence of all faiths, but also to make our planet safer and more secure for all of us. Provided there is the will partnered with creative thought, there is no reason to believe solutions cannot be found. Burdens fiscal budgets in terms of welfare and tax deprivation. 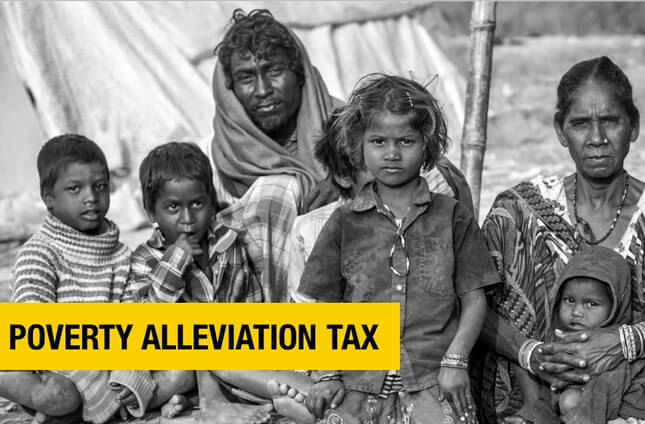 Proposed solution: A faith-based Poverty Eradication Tax - requiring close cooperation between global governments and religious authorities under the auspices of the United Nations. Reports issued by the European Union, the United Nations University and the World Institute for Development and Economic Research have all concluded that global taxation is not only technically feasible but desirable. The principle of tithing, whereby the faithful is obliged to give a percentage of their income to aid the less fortunate is one of the bedrocks of Islam, Judaism and Christianity, and other faiths. Zakat or tithing is the third pillar of the Islamic faith. The Quran does not specify what percentage of a person’s wealth should be dedicated to giving but the customary practice is 2.5 percent. The obligatory duty of Muslims to act with compassion in order to ensure no one is deprived of the essentials for a decent life is often referenced in the Quran and the Hadith. The Holy Quran tells us that Allah characterises those who neglect to support orphans or feeding the poor as “those who reject the faith” (107:1-3) and emphasises that a sincere act of giving will bring abundant rewards to the giver. The Torah, known to Christians as the Old Testament, exhorts believers to give 10 percent of their earnings to the poor. The setting-up of an independent organization (hereinafter referred to as “the Organisation”) to be headquartered in a neutral country and tasked with pinpointing areas of dire need in coordination with (but not answerable to) United Nations organs, such as the WHO, UNESCO, UNICEF, the World Bank, the IMF, as well as NGOs, charities and governments. ‘The Organization’ will be the recipient of revenues generated by a global poverty tax based on a fixed percentage of member states’ respective GDPs and will be responsible for hastening the eradication of extreme poverty concurrently separate from the organs of the United Nations. ‘The Organization’ to be supervised by a rotating committee or board made up of representatives of member states and chaired by a high profile individual with proven credentials in the philanthropic field for a term of no more than four years. No one country or geopolitical bloc should have a controlling stake in ‘the Organization’. Instead, the world should be divided-up into zones each entitled to appoint, say, two or three committee members. Field office should be opened in all capitals to pinpoint areas of need and supervise distribution and projects. Participating states should be required to donate an agreed percentage of their GDP to ‘The Organisation’. A mere two percent annual tax on the world’s four largest economies – the US (US$ 16.77 trillion) China (US$ 9.24 trillion) Japan (US$ 4.92 trillion and Germany (US$ 3.73 trillion) would yield almost one trillion dollars annually. Participating states would be responsible for tithing corporations, companies and individuals in accordance with their official state religion. Secular states, without a single dominant religion, would be obliged to launch media campaigns in coordination with Islamic, Christian, Jewish and other religious authorities to stress the importance of additional taxation dedicated to the poor. Banks, multi-national corporations, philanthropic trusts, charities, religious authorities, and wealthy individuals should be encouraged to donate and to use their best endeavours to promote this worldwide effort. Oxfam estimates that eight of the world’s richest people own as much combined wealth as half of the human race. In light of such inequality, aiding the underprivileged should be viewed as a moral and religious duty.